New Julep box! Boris & Nicole! OMG, I love this color! I will just say that! I was not impressed with the picture they sent me in the email, but I stuck with it and SO glad! This is GORGEOUS! I didn't do a full mani because I loved this color so much it inspired this mani....and as you can see, it stamps well too!!! 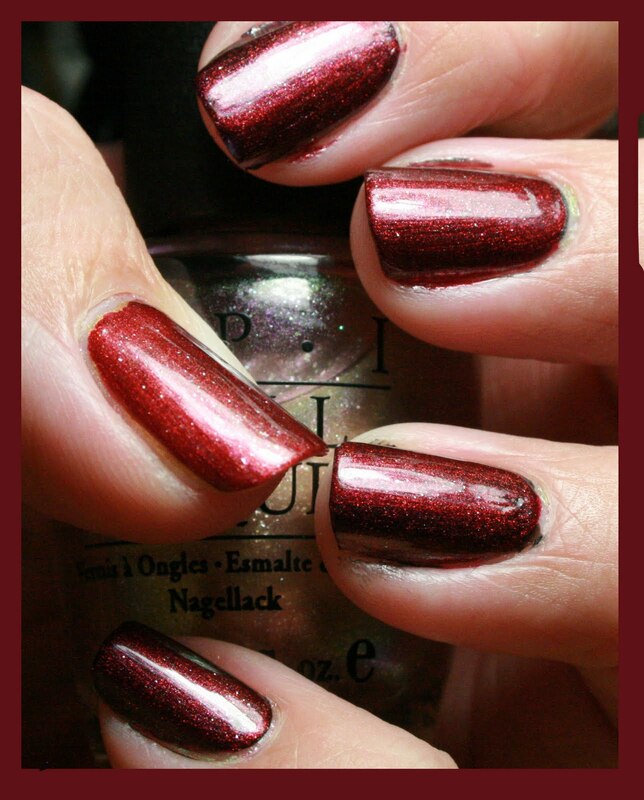 I wanted to do a post to this polish because I feel it doesn't get the attention deserved! I think it is over shadowed by Sand & Stilettos (which I do not deny is utterly amazing and my favorite FF polish!) However, I wanted to give Favorite Girl some well deserved attention! 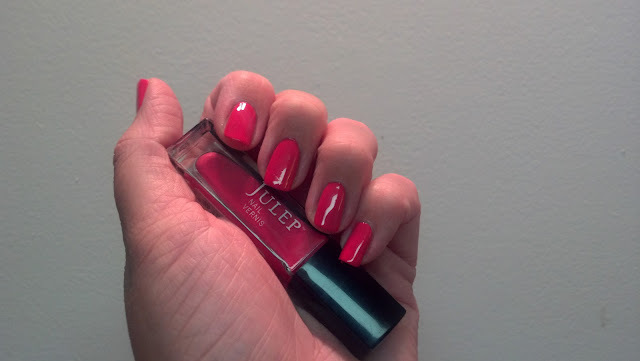 So I got my Julep sneak peek box today, if you don't know what that is, visit Traci's blog for more info! If you join, make sure and click through her link AND send her a quick email to let her know. They have been having 'glitches' with their referral program! So I got the America Beauty box, aside from the two full size polishes I show below, I also got a full size glycerin hand scrub and a full size nail base coat! First up, 'Cameron'...which I find interesting as it is PINK! Not sure how my step-son would feel about that!! The first coat was *almost* enough to do it, but needed a second coat to do the trick. Smooth application aside from a stray hair, lol. No top coat in these pics. I just swatched every franken I have made! Most don't have names but a few do! I hope you like! See pics below, if you are interested, email me RhonniAnaya @ Gmail.com or facebook. They are $10/bottle + $2 shipping. I hope that doesn't seem too high, but I used the good glitter (ie not cheap) and these are a pain to make!!!! I only have the 0.5 ounce bottles you see below made. If there is enough interest, I will go buy more supplies. I will ship internationally, you just have to pay the extra shipping (email me for rates). Franken-stories: Episode 2...Crazy as a Capper? Ok, First I am going to show you three swatches...and you are going to tell me which one you think is Mad as a Hatter....answer is at the bottom!!! Don't peek at other MAAH swatches or your own nails if you have it on! Guess honestly based on memory!!!! :) Leave me a comment and tell me your thoughts! Did I nail it? 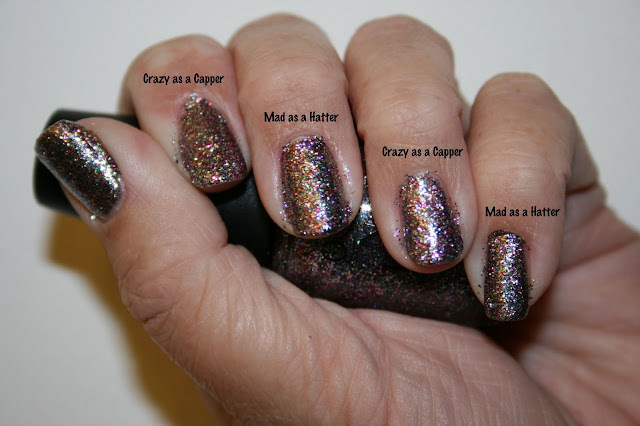 So...I have a couple bottles of Mad as a Hatter so I really don't need to dup it....however my good friend Traci is so ga-ga over this polish, she wants a backup bottle. So while I am on the hunt for a backup bottle for her, I decide to try to dup it!!! So here are some pics of my first glitter franken dup-ing attempt! I have to say, if the Mad Hatter were secure in his masculinity, he'd wear my version....it's PINK!!! Don't worry, Traci, now that I have created this one, I know what to do differently (I think) to make it not-pink....I might have a decent dup for you shortly! Not a lot to say tonight, had an epic day dusty hunting and these are just some of the spoils!!! I'm exhausted!! I did one hand in OPI DS and the other in China Glaze OMGs. What is noteworthy to point out is that it took 2 coats of OPI DS to look nice, most of the China Glaze went on in one, smooth, dark coat. Unfortunately the sun has set and I can't see these babies in the sun...I'm kinda worried about my drive to and from work tomorrow!!! !